Michael was born in 1958 in Brooklyn, New York. In 1976, right after high school, he joined the U.S. Navy and served from 1976-1979 on the USS Sampson stationed at Mayport Naval Base in Jacksonville, Florida. When his tour was up, he worked for Morgan Guaranty Trust Company. After leaving Morgan Guaranty Trust Company, Michael worked odd jobs and travelled because he was unable to find a stability due to his addiction. He was homeless for years because he struggled with substance abuse. He realized when that he needed a fresh start, so in September 2013, he moved to Atlanta. On October 5, 2013, Michael went to a Stand Down and was directed to the United Way table. He was interviewed, while he did not expect anything to come out of it, two days later he received a follow- up call from them. 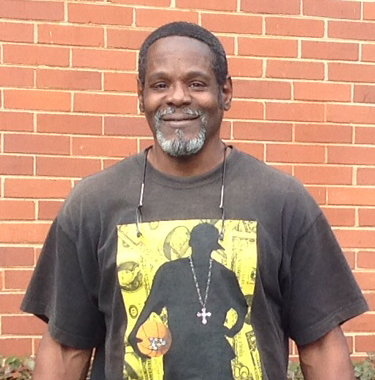 They connected him with Homes of Light for transitional housing and he was so grateful to be out of shelters and off the street. Now, he has his own apartment, has started working for Veteran’s Empowerment Organization, and has been connected to Furniture Bank. By working for the VEO, he is helping other people that are in a predicament similar to the one he was in.